The Written Nerd: Comment: Books and the Environment, or, Can we be proud of what we sell? Comment: Books and the Environment, or, Can we be proud of what we sell? This is the tip of the iceberg of a huge conversation, but I just want to get it started. This week at the ABA publisher forums, the first evening was a session where publishers answered questions compiled from a number of booksellers. One of the biggest was, of course, what publishers are doing to make their industry more green. I admit to being a tad disappointed by their answers up there on the dais -- most of them had to do with making their offices more green, like not using water bottles and not printing out emails. That's good, but obviously the question really refers to the huge impact of the massive amounts of paper used to create their product: books. I jumped up and made an impassioned (and okay, slightly drunken) plea that publishers start talking about whether we can be proud of where books come from, in terms of both the environmental impact and the labor impact. If books are being made from paper from trees cut down in the Amazon and printed and bound in sweatshops in China, we need to know, and it needs to change. Nobody really responded to my question/plea (they didn't exactly ignore it -- the conversation just moved on). I wasn't sure whether it's because it was a dumb thing to say, or they just didn't have an answer, or they didn't want to talk about it. In talking the whole thing over later in the week with my buddy Steve, who works both the bookselling and publishing angles, I've realized it may have been all of those. And I also realized how little I know about where the books in my store come from. First of all, Steve set me straight on the sweatshop printer thing. Most books published in America, he tells me, are printed in American printshops, because it's still a skilled labor thing, not the automated factory monstrosity I'd imagined. In fact, you can usually find out where a book was printed right on the copyright page. I'd never looked. Some books, though by no means all, actually have the name and address of the printer on the title page, and most say "Printed in the USA" or words to that effect. I guess that doesn't guarantee no one's being exploited, but Steve says in his visits to printers everyone seems to take pride in their work and think of themselves as artisans. Well then, where do the trees come from?, I wanted to know, clinging to my righteous indignation. That we couldn't answer, though he promised to look into it. But he did send me this bit from Publishers Weekly -- talk about impact. "The U.S. publishing industry emits over 12.4 million tons of carbon dioxide each year, or about 8.85 pounds per book." I'm going to have to read more about that in PW this week. Clearly that number ain't good, and we need to change things if we can. At the forum discussion, one bookseller (the clearly brilliant Arsen Kashkashian, head buyer at the Boulder Bookstore and proprietor of the blog Kash's Book Corner) asked whether publishers couldn't increase the price differential between returnable and non-returnable books. That would be an incentive for booksellers to buy non-returnable, which would mean fewer books returned to publishers. Returns often get pulped, destroyed -- massive waste of paper and energy. But would that result in fewer initial book sales, as booksellers are more wary of taking a chance on something they can't return? Another suggestion (mostly posited by those outside the book industry I think) is the move to electronic books -- just get rid of that pesky paper altogether. While I'm intrigued by e-books, I think that's a false switch. Paper, at least, is recyclable and biodegradable (usually). While digital files don't have a carbon footprint exactly, the electronics to read them on are made with metals like mercury that don't go quietly back into the earth -- they're difficult to dispose of and sometimes literally poisonous. And electronics often come with "built-in obsolescence" -- they're designed to be tossed when the next big thing comes along, adding to the massive, scary amount of e-waste. One thing some publishers are talking about is using paper from sustainable forests -- that is, those that are managed, replanted, not clear cut, and thus better for the ongoing health of the planet. And of course, there's always the option of printing on recycled or partially-recycled paper. But both of those options are more expensive than traditional methods, which might lead to jacking up the cost of the book itself, or a cut in profits to the publishers if not. So the move is happening very slowly, if at all. All of these solutions are problematic, but it seems as though we've got to start thinking about it. What do YOU think? Do you have knowledge to share about any of these factors or practices? What do you think makes the most sense for the book industry to do going forward? Any insights or thoughts would be much appreciated. It seems clear that this is the something we need to tackle as an industry, and something we should be better informed about as booksellers. I hope to talk more about this in the next few weeks. In the meantime, I feel lucky to work in an industry that's got enough idealists that we know we've got to do the right thing, even if it takes a little while to figure out what that is. The environmental market is soaring right now - from Clorox green to organic foods - and publishers would be foolish not to recognize that pragmatic value of advertising "green" books. It's nigh impossible to get companies to change because of ethical reasons or because, you know, the planet might be saved, but I think there's a clear way to market this, and that should drive change. Great post, thanks. Check out the Green Press Initiative (www.greenpressinitiative.org) for a lot of good information. 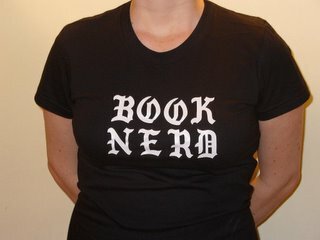 Also, I want to give a plug to a printer, BookMobile (www.bookmobile.com). I haven't worked with them myself yet, but I'm very impressed with their environmental initiatives. I also think their forwardness about those initiatives is a model for other printers and publishers: Tell your customers what your doing, flaunt it even, let them see how something costs more in dollars but costs less in impact, and let them make the decision. I appreciate it when a printer I am thinking about working with offers "green" options. And I take them whenever I can. One book that addresses this question is CRADLE TO CRADLE, which you must read. As a philosopher, I love what the authors do in taking the problem out of the realm of ethics (where things are so sticky, and it's near impossible to get people to agree) and reframing it as a problem of design. Their book itself is an exemplar of the solution they propose for books, which fits into their general notion of designing objects for the life of the materials. You'll love it! I think one way publishers could begin cutting back might be with their catalogues. Every season catalogues are mailed out so we know what books to order, that's a huge amount of paper that will ultimately end up in the recycling bin. I know staring at the computer wouldn't be as easy when going over orders, but couldn't that make a difference?